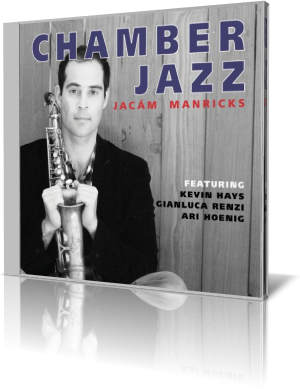 Classical music composed for a small ensemble, mixed with the improvisation of jazz might sound something like Chamber Jazz (2016) by saxophonist Jacam Manricks. Manricks plays alto, soprano and tenor saxophones, flute, alto flute and clarinet. His accompanists are Kevin Hays, piano and Fender Rhodes; Gianluca Renzi, acoustic bass; and Ari Hoenig, drums. Manricks unloads his arsenal on the haunting “Ecmish.” He uses the soprano for the lead, but later adds the tenor in a counter-melody, and layers the alto sax and the flute for harmony. Hays sets the tone with an ascending, four-note piano phrase that’s repeated throughout the main theme. He switches to the Rhodes for a middle solo, which is accented strongly by Renzi and Hoenig. After the trio builds to a stunning crescendo, the song downshifts to tranquility. Manricks then takes the soprano on an easygoing jaunt. The alto is the preferred tool for “Mood Swing.” The mood is brooding, with a rhythm that has elements of a military march. The piano chords are intense and dramatic. Hays gives the toms a workout. For his part, Manricks pushes the alto to its extremes, making the instrument squeal at key moments. Manricks composed all but two tracks, covers of songs by Miles Davis and Jean Sibelius. The album features music he has been writing and performing for years, much if it with the musicians’ styles in mind. This is Manricks’ fourth album as a leader, following Labyrinth, Trigonometry and Cloud Nine.